It’s hard to imagine pop music today without Brian Eno. As a founding member of the seminal glam rock group Roxy Music with Bryan Ferry, the father of ambient music and a producer for the Talking Heads, David Bowie, U2, Laurie Anderson, and Grace Jones (among others), Eno has played no small part in catapulting his collaborators to pop-cultural icon status. 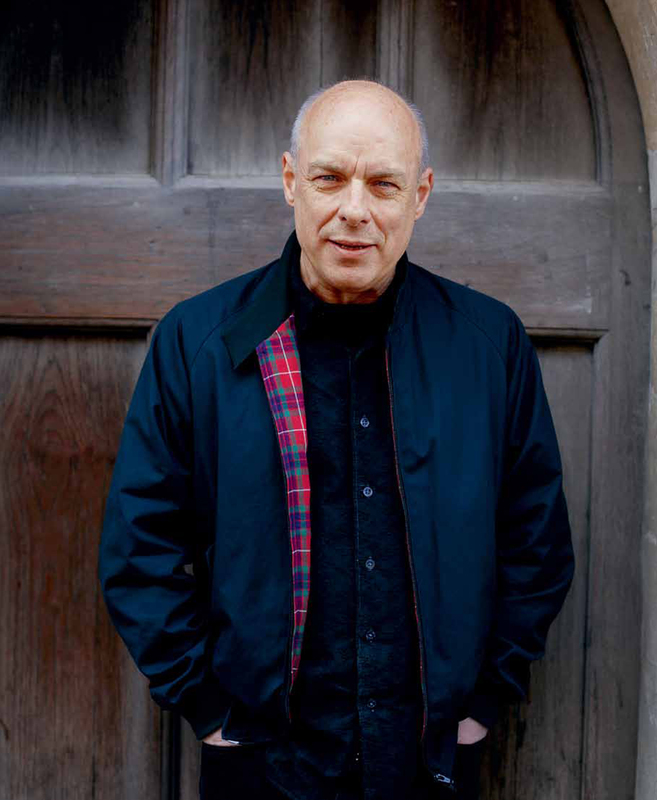 A firm believer in using the recording studio as a compositional tool, Eno’s penchant for experimentation has accelerated the evolution of pop and taught generations of musicians about the importance of atmosphere. In 2011, Max Dax spoke to Eno in his London studio about venturing beyond the trusted avenues of making music, analyzing milliseconds of sound, and whether or not Bono has a sense of humor. Where are you from, Belgium? No, Germany—up north near the Baltic Sea. I grew up by the seaside too, in Suffolk. Isn’t it strange how your thinking and emotions adapt to the horizon when you live near the ocean? When you’re used to space, you need space to be able to think. Lots of people who grew up near the ocean say they wouldn’t be able to live landlocked in the mountains somewhere… Seems like you’re shaped by the landscape you grew up in. At least that’s true for me. That reminds me of some of some of the things I’ve read on Rick Holland’s blog, with whom you’ve also recently been collaborating. As a poet, he very elegantly documents, step by step, his forays into the metaphysics of memory and everyday life. I appreciate it when artists are so transparent about what they do and why they do it. That’s understandable for a journalist. Do you often go to poetry readings? No, actually never. I don’t often attend anything, really. And when I do, like it was in Rick’s case, then only because I’m looking for something. I always ask myself: How can I use what I see? How does that fit in with what I’m doing? And then when I like something, I immediately start to analyze it: Why do I like it? What parts did I like most? Is it something that I do better or do they do it better? Is it something they do that I don’t do at all, but should? On the rare occasion that I happen to go out, I’m constantly processing these kinds of questions. What’s so particular about Rick Holland? He’s very fast, and that’s important when working with me. Is it important that he’s not a professional musician? Yes, absolutely. It was very inspiring working with him, because he made me pay attention to music in a different way than a normal musician would’ve done. And also, in some ways, I think I had a similar effect on him. I was interested in his poetry from a musical point of view. I’d say to him: “Can’t you get rid of three syllables in line two?” Or: “Can’t we repeat line four twice?” And he never argued about these things. He’d change the lines or do something totally different…which I think is extraordinary, because you wouldn’t expect that from a poet, would you? You mean you wouldn’t expect a poet to be such a pragmatist? In a sense, yeah. In terms of the project as a whole, I would say that I made all the music and he made all the words. The division is fairly clear. But we still were able to give our input in both directions. Because we were in charge of different domains there was never any clash of egos. There was never anyone saying, “No, that’s my work! You can’t touch that!” It just didn’t happen. You’ve had lots of experience working with big names and big egos. How did you deal with that in the past? Look, you just deal with it. People can be quite territorial about what they’ve made and what they think they’re good at. Sometimes rightfully so. Do you think ego and talent and good ideas are inseparable? Not always, but good ideas certainly make the difference between the good and the brilliant. Your work often seems based on strikingly simple ideas and you tend to finish stuff quickly—it’s almost the opposite of a composer who spends weeks or months to finish a piece of music. 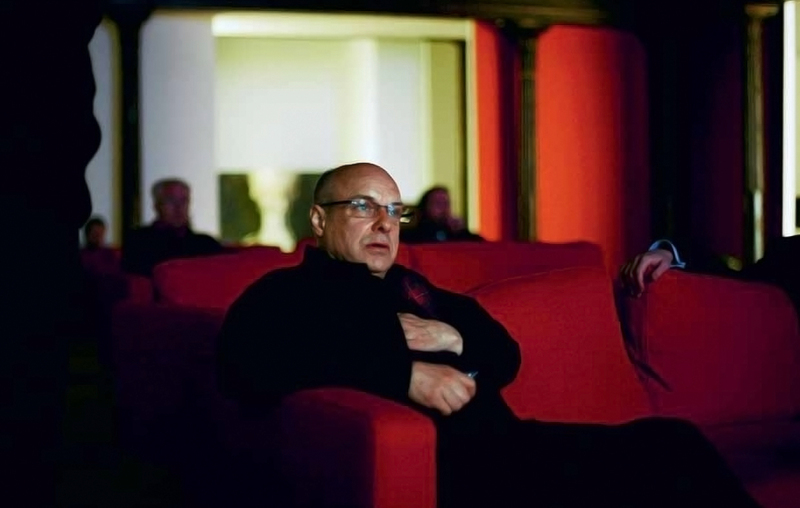 Brian Eno, photographed by Martin Godwin. Have you ever studied other people’s methods for producing good ideas and cultivating a creative state? My favorite method is stopping everything for a moment. It’s amazing how difficult I find it these days to simply sit quietly. For example, yesterday I ended up on a long train journey. It wasn’t supposed to be a long journey but I got on the wrong train. I was late; I ran into the station, saw a sign saying “London” and just jumped on the train. I tend to do things like that now and again. It was the slowest train I’ve ever ridden. It went from Southampton to London and stopped at 23 stations. I didn’t have a book with me, so I thought to myself: why not sit still for as long as you can? I used to be able to do that. I used to fly to America without anything to read and I never used to watch the films they were showing. I just sat still for seven hours. But yesterday… Jesus, it was a nightmare! Every few minutes I was checking my phone or texting someone something. I have to discipline myself. When you miss a flight or a train you’re confronted with time that you didn’t expect to have. I like to think of it as a gift. Sleeping is sometimes an option. But I often let my thoughts float freely. Every now and then something evolves out of such idle moments. Arto Lindsay always asks me: “When was the last time you did nothing for half an hour?” I’m notoriously fidgety and have a hard time not answering messages or multitasking. The original idea of ambient music was to try to give the listener an excuse to do nothing for some short period of time. Funny enough, the idea started in Germany—in an airport. Except that there was this terrible music playing—it had just nothing to do with the rest of this experience, and I thought how ridiculous it was that you would spend hundreds of millions of Deutschmarks on building an airport like this and not think about the music you play in it. You know, everything else was so controlled and so well thought out. Music for a space like this has to match the environment; it has to be designed; it has to be ambient. All I could think is how great would it be to have music which tells you to sit down, relax, and do nothing for the next 20 minutes. Would you say ambient music is functional? Absolutely. But at the same time it’s sort of the opposite of muzak, which also should be considered functional, you know. Muzak exists to facilitate work, something that lifts your energy level a bit and gets you back on the assembly line doing your job. Exactly. And I wanted ambient music to do the opposite. Playing ambient music in a place like an airport would seem like a typically German approach to functional music, don’t you think? Three seconds and a third, to be precise. Working on a miniature piece of commissioned music impacted me in a very specific way; it influenced my perception of time. When I started working on normal three- or four-minute pieces again after having spent months focusing on milliseconds, I had the impression I was swimming in an ocean of time. Designing Microsoft’s sonic stamp made me feel like a jeweler, like a diamond cutter. Usually, I feel more like an architect who builds big things, although that’s something I only realized in hindsight. Thanks to the Microsoft job, I realized how big my other projects of the past had been. It’s very hard to find a name for what I do, because I’m not really a musician. For the Microsoft sound, I had to work on an almost atomic level—with atoms of sound. If you’re not a musician, then what are you? To what extent, then, do you consider yourself a producer? First and foremost I try to help the people I work for do away with stuff that doesn’t work. I have to do that, because otherwise projects become crippled by indecision; people are often paralyzed by a range of choices when they’re presented to them on a silver platter with unlimited time to explore and process them. You can’t forget: Everybody works better with fewer possibilities. You see it over and over again that good artists end up coming back to the same ideas they’ve always worked with. And with every year that goes by, they get better and better in understanding the chemistry between these ideas. It’s not an argument for stopping or giving up experimentation. In fact, I’ve spent years in my little studio trying out the new tools and gadgets, which happens almost every week. But constraint is a very useful tool in a lot of ways. Constraint also in the sense of: When are you going to finish this? How much time are you going to spend doing it? Where do you think it’s headed? Who’s going to listen to it? Are those ideas valid for your production work with, say, Coldplay and U2 as well as with your own stuff? One of the problems with very successful bands is that they don’t have a limit on their budget or their time—they can just keep going and going and going. They also usually own their studio, so for them it doesn’t matter if they spend a day in there doing nothing. It doesn’t cost them money, and maybe they don’t have anything better to do anyway. What else do you consider to be as important as narrowing the range of creative choices when producing? I like to break up days and structure them. You have breakfast, work for two hours on a project, check your emails, work on another project for another two hours and then lunch. Your day has to be a measurable process, in order to minimize aimless drifting. Of course, you can have some days on automatic pilot, and there’s nothing wrong with drifting in and of itself. But you can’t do that every day—you’ll never get anywhere. Do you ever find yourself in situations where you’ve run out of ideas? Absolutely. I often get completely bored with myself. Then I know I need a holiday…from myself. I remember playing PlayStation a few years ago and listening to the generic patterns of the endless music and thinking that it was a rip-off of your work. Do you sometimes think: “I invented this!”? I sometimes think that, but to be honest, it surprises me even more how long it takes for a good idea to get through the system. Generally, when I encounter something in a new context that I had been doing 20 years ago, I tend to think: “I was right.” And that’s a good feeling. I might react different though if someone wrongly claimed an invention for themselves. I would probably feel the need to set them straight. But people don’t do that. They just use ideas and don’t claim they were theirs, and that’s perfectly all right with me. I’m not poor; I’m not dependent on something I did 30 years ago for my income. So, when you see Lady Gaga in her famous meat outfit, you don’t think: that was my idea! She probably never heard about my meat outfit with Roxy Music. I think she studied art and popular culture at NYU and when she gives interviews, she always cross-references, so there’s a good possibility she had. The only thing I care about in ego terms is that I want people to know that it was me who put the flag in first. It’s like going to the North Pole. In fact, when Peter Chilvers and I did the Bloom app, I was convinced there must be at least 25 people all over the world working on something very similar. It was such an obvious thing to create—given how everything had progressed in the past 20 years. When we finished it and presented it to Apple, they loved the idea and wanted to do a campaign for it, which they said needed six weeks to put together. But I insisted that it should be out the following week—I just wanted to be the first one to do it. I wanted the world to know. Two reasons: One is that I sometimes come up with an idea that’s the first of its kind. Why should somebody else get the credit? The other thing is if someone else is quicker than me and comes out with a crappy version of the same idea, then it kills the chances of the good version being heard or seen. I was and am self-confident enough to be able to say that the other competitors just weren’t as good as Peter and I were. You make it sound as though you have some special antenna which tunes you in to people working on similar things, and that’s why you have to be so fast with coming out with the idea. I think the ideas that suddenly pop up do so because there are a lot of other ideas in other places that are all pointing in the same direction. Sometimes you only need to wait for the next technological innovation to realize great ideas you’ve had in the past. Yeah, that’s a good example. Suddenly all these ideas that were floating around randomly are realized after some big evolutionary step in technology. If you were following the ideas before, you’re not surprised at all by these inventions because you can anticipate them. You were basically just waiting for them to happen. Some people might say that Bloom was just an app—what made it so important for you? Exactly. But also like Terry Riley’s In C or Steve Reich’s Tape Pieces. These too are great examples of self-generative music to me. They really represented a new kind of composition and way of creating music. I think some of my own stuff—Music for Airports or Discreet Music—were also examples of that. But these records were like fossilized versions of those processes; they were nothing more than examples of the million possibilities of how these records could have sounded. They showed 30 minutes of a process that lasts forever. With Bloom I waited decades to be able to release the process itself—and not only a snapshot of it. The iPhone gave me the possibility to release the source code, and I wanted to be the first. I actually released something like Bloom 20 years ago, but it didn’t work out because technology wasn’t advanced enough. It was called Generative Music 1 and it was sold on a floppy disc. Actually, it didn’t sell at all. I still have an author’s copy somewhere in my studio. It probably is a collector’s item today. Have you heard of any musicians that used a Bloom sample in a hit single? I don’t consider Bloom to be a tool for making music—I see it more as a piece of music that comes to life if you bother to switch it on. It’s always sitting there with all its possibilities and all the ways it could be. I’m sure that somewhere in the world someone is playing Bloom right now and bringing to life one of its endless possibilities. But do you know of any song or record that’s referenced Bloom? There’s supposed to be a Radiohead track called “Bloom” that opens with it, but I don’t know if that’s true. By the way: time’s up—I have to follow my pattern. Anything else you’d like to ask? I heard this joke the other day: What’s the difference between God and Bono? I don’t know this one—tell me! When God walks down the street, he doesn’t think he’s Bono. That’s great—I’ll have to tell Bono that one. Are you kidding? Of course he does. This article originally appeared in the Fall 2011 issue of Electronic Beats Magazine, and the cover image was taken by Martin Godwin. To read more from the magazine, including articles from the Summer 2015 issue, click here.